A Learn-by-Doing Guide to MEAN Stack Web Apps. 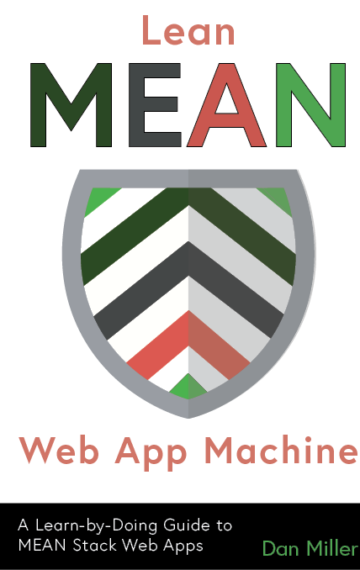 Lean MEAN Web App Machine is for anyone interested in learning how to develop MEAN stack web applications. The MEAN stack is a collection of four main software application components (MongoDB, Express, Angular, NodeJS) that are used together to form a complete web application platform. This book provides a real hands-on learn-by-doing approach that will keep you interested. You’ll enjoy real-world examples delivered in a fun and light-hearted style while discovering (or reinforcing) core skills that every software professional would want in their repertoire. Lean MEAN Web App Machine is what you might call a tutorial-style guide. The material takes you through a series of activities that help develop knowledge by gradually building up a practical MEAN web app framework. You would like to create your own web apps using the MEAN stack and would love a starting point. What will you get out of reading it? Lean MEAN Web App Machine is structured around the idea of gradually building up a functionally complete environment, framework and code-base for a MEAN stack web application. Many technical books tend to launch you deep into the background of a specific technology including its fundamental principles, architecture, structures, data types, etc. For someone just starting out with a technology, that traditional approach is a bit backwards. The structure of this book addresses this issue by providing you with a series of incremental wins. Each time a new topic is introduced you get to apply it then find out a little bit about the thinking behind it. The idea is to take you from a minimal starting point all the way to a working MEAN ‘starter kit’ that you can use time and again as a launch point to kick off your future projects.